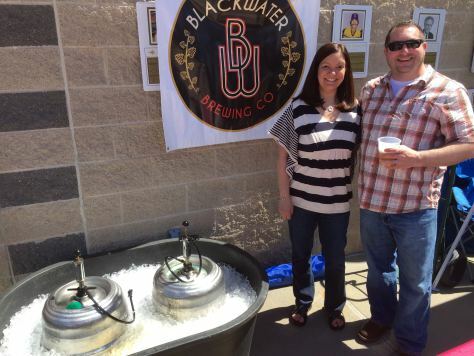 Owners Lincoln and Amanda Wilkins purchased Blackwater Brewing Company in May 2012. The once-thriving Brewhaus and associated food operation had seen better years, and were in need of significant revitalization. Four years (and much blood, sweat and tears) later, a new Blackwater Brewing Company is emerging, as we expand our production brewery operations and welcome on-site a new eatery, Barrels Brewhouse! Re-energized Atmosphere, Food Service, and high-quality Artisan Beers await you! Lincoln is a West Virginia native, born and raised in Keyser, “down off the mountain”. His family has deep roots “on the mountain top”, having migrated here in the latter decades of the 19th century. A sturdy stock of German, Austrian, Dutch-English and Scottish ancestors settled in the vicinity of Canaan Valley, and in their pursuit of the American dream thrived as Cattlemen and Coal Miners, as Railroaders and Entrepreneurs. Following 25 years working around the country at various levels of Academia and Industry, primarily as a Neuropharmacologist, Lincoln returns to home soil, to pick up work where generations left off. He is passionate about the brewing sciences, and serves as Head Brewer for Blackwater Brewing Company. Amanda hails from New Orleans, home to some of the finest and most unique drinking establishments and eateries in the United States. In a former life, she leveraged a deep-rooted family association with Broadcasting and Marketing into a successful career in Corporate Sales. She now plays a pivotal role in the re-branding and marketing of our hometown business. Through the course of their relationship, Lincoln and Amanda have always shared a strong interest in fine dining and wines, and more recently craft beer. A life-long beer enthusiast, Lincoln initially dabbled in the mechanics and business of brewing via a brief foray into start-up and ownership of a Kölsch brewhaus, the Heinerbrau Brewery (now Covington Brewhaus) of Covington, LA. Later, partnership with two exceptional brewers, L.J. Strassel (home brewer extraordinaire) and Kevin McMahon (former brewer at Abita Brewing Company and Two Brothers Brewing), fueled a passion for home brewing, recipe development, and greater knowledge of the brewing arts, all of which are now drawn on to produce our evolving line-up of fine ales at Blackwater Brewing Company. What are we about? What’s important to us? What’s New? We’re not concerned with what’s hip, cool or trendy. Fads come and go, along with restaurants and breweries that follow them. We firmly believe that “Things of quality have no fear of time.” We produce European-style Session Beers of German, Belgian and English derivation. We distribute our beer within West Virginia, and are expanding our taps across the Potomac Highlands and North-Central regions of the state.